Advertising will literally pay off for NYC now that ads will be used to fund the city’s plan for the world’s fastest municipal Wi-Fi network. Through an Internet initiative called the LinkNYC program, the city will turn 10,000 out-of-date pay phones into high-tech hotspots offering speeds up to 200 times faster than some LTE connections. The program will provide instant Internet access to millions of people every day, all free of charge and free from data limits. And the program won’t tax the taxpayers because its costs will be completely covered by ads. AdAge.com reported on how the plan will provide New Yorkers with a steady connection to the Web, while connecting the city to a steady stream of ad revenue. LinkNYC is expected to revolutionize the way that advertising is served in one of the world’s most important and influential markets. The program will partner New York City with the technology firms Titan, Control Group, and Qualcomm. Titan will sell ads for the digital displays on the sides of the hotspot hubs, while Control Group will manage the user experience and Qualcomm will oversee the hardware. Not only will ads fully fund the construction and upkeep of the Wi-Fi network, but they are also expected to generate $500 million for New York City over the next 12 years and billions down the line. The first 500 links are scheduled to appear at the end of 2015, with up to 10,000 more rolling out in all five boroughs over the following four years. The effective radius of the Wi-Fi network is expected to be around 150 feet. Two 55-inch digital displays will be available on each hotspot hub to allow multiple ad placements on each location link. The digital orientation of the ads will provide greater flexibility and profitability than the existing print ads on these former phone booths. The links will also offer charging stations for mobile devices, tablets for accessing directions and city services, and broadcasting abilities for public service and emergency announcements. 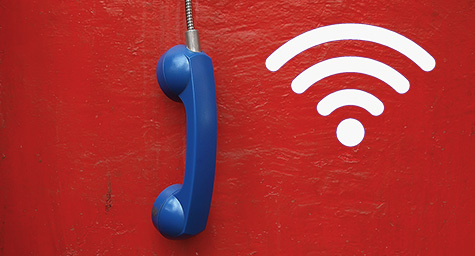 Free phone calls to anywhere in the U.S. can also be made from these hubs. In the interest of privacy, the links will not be equipped to deliver location-specific ads to consumers. The program’s partners have promised complete privacy to users and assured that the links will only accumulate anonymous usage data for general reporting purposes. They also stated that they will never share personally identifiable information with third parties for their own uses. The success of LinkNYC could serve as an advertising model for other cities and expand the ways that ads pay off online. Discover innovative ways to gain advertising revenue. Contact MDG Advertising. MDG Advertising is a full-service advertising agency and one of Florida’s top branding firms. With offices in Boca Raton and New York City, MDG’s core capabilities include branding, creative, logo design, print advertising, digital marketing, mobile marketing, email marketing, media planning and buying, TV and radio advertising, outdoor advertising, newspaper, video marketing, Web design and development, infographic development, content marketing, mobile marketing, social media marketing, and SEO. For more on the latest trends in branding and advertising, contact MDG Advertising.